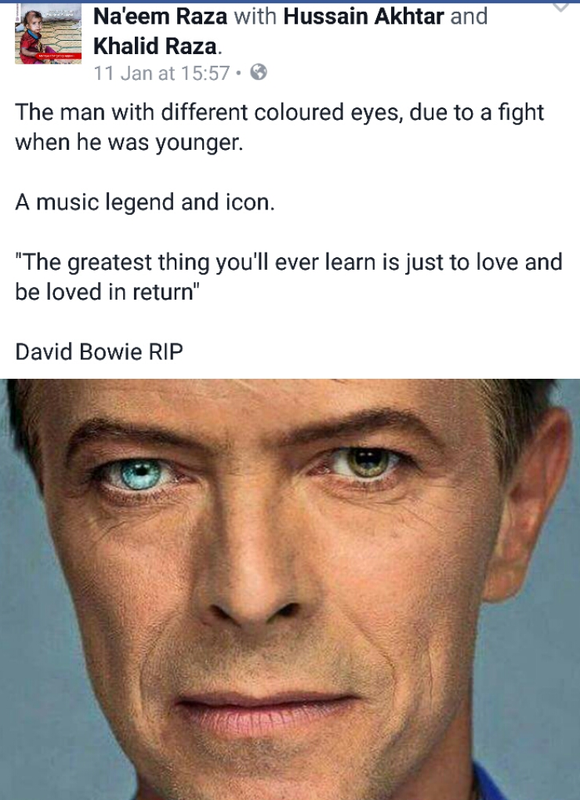 David Bowie the British music “legend” died yesterday due to his long standing battle with cancer. Widely herald in the media for the “tremendous and ingenious work” he had done in his field of music, achieving worldwide fame and respect as a musician . From leading politians to musicians from across the world condolences have been flooding in all full of praise and adulation for the singer. Why does this matter and why am I even writing about the self-proclaimed occultist? The simple answer is, among the throng of famous and the not – so – famous people heaping praise on the singer, there are, as usual, mole Muslims who go to great lengths in order to feel inclusive and appease the white folks as it were to show they are not extremists but just normal human beings. That, like many they too listen to music and “appriciate” a masterclass when they hear it. 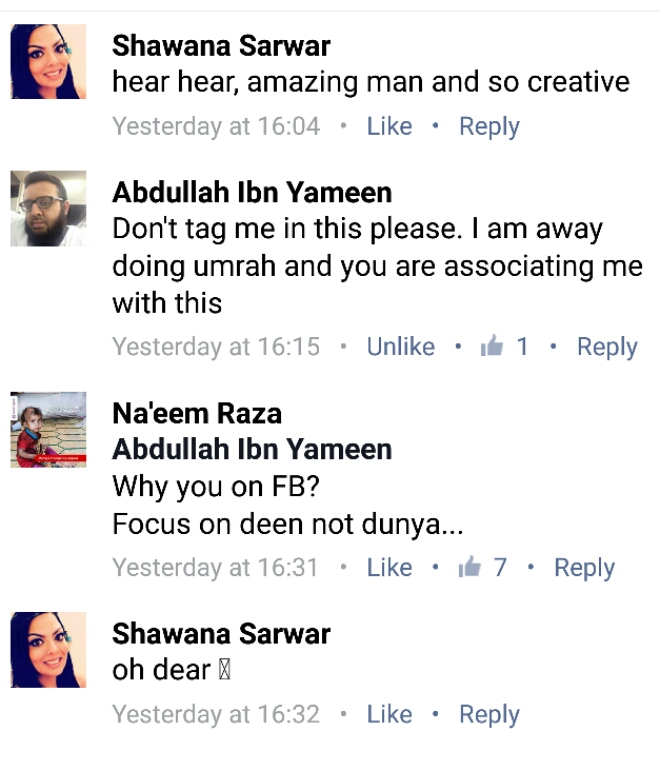 Facebook has been awash with very liberal Muslims expressing their sorrow and shock at the demise of a “great creator, icon and genius” . It is beggar’s belief to think doing this in some way will do them favour to help them fulfill their goals – make them be seen as someone different from the “rag wearing dirty Muslims of the backward cave dwelling places of the Muslim world”. 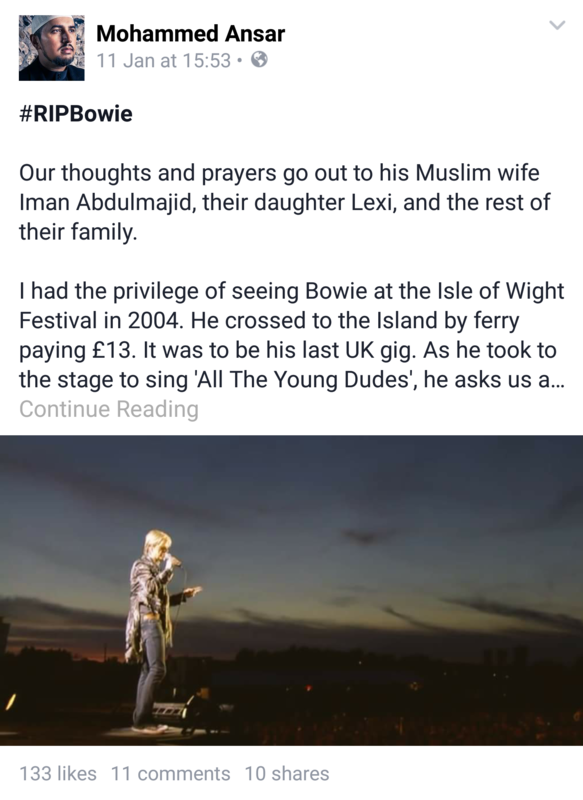 Here is another “public commentator” Mohammed Ansar expressing his undying love for Bowie. What’s the big deal if someone is showing remorse for a being who has died? Is this now another compulsory thing to have to have to do; express sadness and remorse for all celebrities who die and failure to do so is a sign of extremism? Should we not see who a person is and what his goals in life was before we jump headlong into the bandwagon with the rest? Thirdly, does it mean now the younger generation of Muslims growing up in the west should listen to music as it is a harmless form of expression and art, regardless of who sings it or what his background is? Yes I am aware of the hadith in which the prophet Sallahu alihi wasallam stood up for a Jewish person who had died and his funeral was passing by. This was done as a gesture of respect to a fellow human. If this is the reason why these the liberals are expressing their remorse then this should be done for all, the famous and the not so famous. But this does not happen and nor will it ever, as there are ulterior motives why someone does an act. For the liberals there is no question on where they stand. These are the people who will, if not already, in a few years time say whats wrong with a harmless pint or a night at the club? Finally it brings me on to asking who was David Bowie? – (for all those who may not have heard of him) . In brief, he was a devout occultist who was a hardened follower of Alcester Crowley, author of the Satanic Bible and Anton Levay, the founder of the Satanic Church. Below is another example of the type of person he was; a man with dark intentions right though to his very soul. I understand why something like this is wrong, but what about classical music? I listen to classical music all the time, and it helps me to be calm. It relaxes me. By classical I mean like Beethoven, Chopin, etc. I can’t see how this could be condemned. It is so beautiful, and I think it demonstrates the perfection of Allah’s creation. Islam will benefit and live up to its expectation as the ‘religion of peace’ only when liberal muslims take control of it, just as liberals have done to Christianity. Conservatives and Religion never mix well.